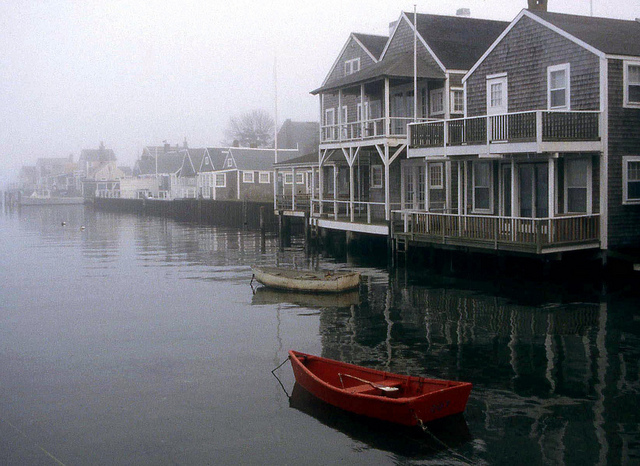 A visit to Nantucket is very much like stepping back in time to a quieter, simpler existence. The relative isolation of the post whaling days left the island protected from encroaching commercial development and left original architecture intact. The iconic gray shingled houses, brick sidewalks, cobblestone streets and electrified ‘gas’ streetlamps lend emphasis to the atmosphere of bygone days. Although a year round destination, the island’s cranberry bogs, heathlands, moors, bike paths and limitless public beaches are more comfortably explored during the ‘official’ tourist season which lasts from the Daffodil Festival in April until the ‘Christmas Stroll’ on the first Saturday of December. The island is nothing less than ideal for activities such as fishing and shell fishing, golf, biking, surfing and birdwatching. There are harbor tours and sunset cruises offered on a regular basis. 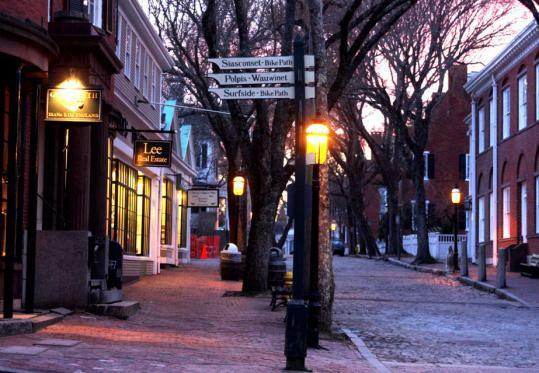 But perhaps the most enjoyable activity, unique to Nantucket is a leisurely stroll around the historic district. 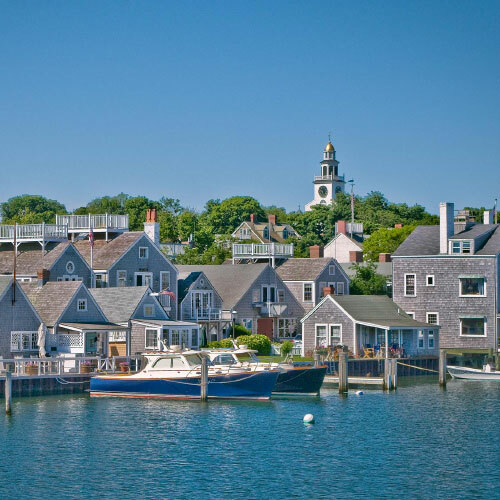 The strict building cod put in place during the 1950s left a treasure trove of more than 800 pre-1850 buildings within a one mile radius in Nantucket town. There is little need for a car on the island, as there is a good public transportation network in town as well as shuttle buses and bike paths granting easy access to the rest of the island. Probably the best view that can be had on this relatively flat island, is accessed by climbing the 94 steps of the First Congregational Church tower. The Nantucket Whaling Museum is housed in a former candle-making factory and is over 80 years old. 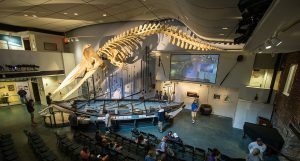 It contains a 46 foot skeleton of a sperm whale, the restored candle factory and countless unique artifacts from Nantucket’s whaling days. Also interesting is the Nantucket Shipwreck and Lifesaving Museum. The museum features ship models, paintings and exhibits dedicated to those who risked their lives at sea. Lightships were ships that were sent into the dangerous waters around Nantucket to act as floating lighthouses to provide light to passing ships. The ships were staffed with about 10 men, who started weaving rattan baskets to pass the time. 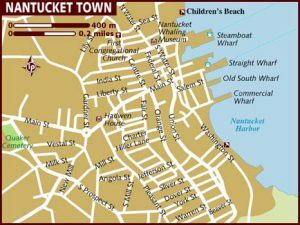 The Nantucket Lightship Basket Museum celebrates the art of the lightship basket and its history. The Oldest House is the house built in 1686 for Jethro Coffin and his new bride. It has been beautifully restored and landscaped and a visit offers a view of life in the late 17th century. The historic library known as the Nantucket Atheneum, is a great choice for a rainy day. The beautiful architecture and furnishings are worth the visit alone. It houses an extensive book collection, and offers classes and events on a regular basis. Siasconset, or ‘Sconset, is a village on the eastern shore which started as a base for fishermen. Cottages dating back to the 18th and 19th centuries distinguish this settlement which became known as an actor’s colony at the beginning of the 20th century. The village still has only about 200 permanent residents, but offers numerous vacation rentals, an excellent beach and a cliff side walk. Nantucket has many beaches. 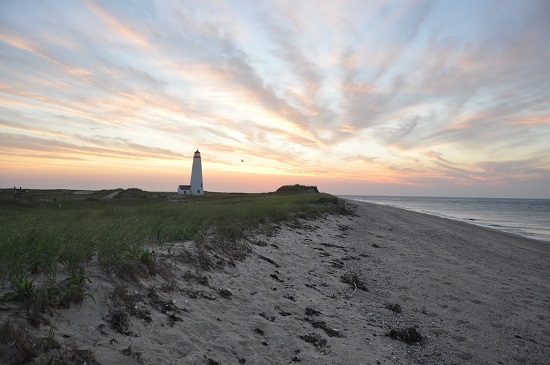 The north shore beaches are protected by Nantucket Sound with warmer water and calmer waves. The south shore has more waves which makes it more popular with surfers. Jetties Beach is easily accessible from town and offers all needed amenities. It is also the location of the annual Boston Pops summer concert. Children’s Beach is shallow and mostly wave free. It offers family activities and is near to Steamboat Wharf. 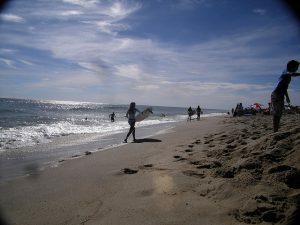 Surfside Beach on the south shore, is likely the most popular beach, especially for surfers. It is also ideal for picnics and offers full facilities. The younger party crowd can be found at Nobadeer Beach, also on the south side. And for quiet, ‘Sconset Beach on the eastern shore is your destination. 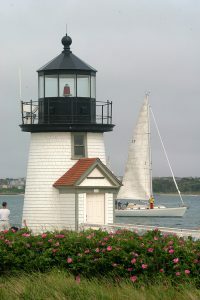 Nantucket is also known for its three lighthouses. Brant Point Lighthouse was first built in 1746 and is the lighthouse that welcomes visitors as they enter Nantucket Harbor. Fires and storms have destroyed the lighthouse many times, making it the most rebuilt lighthouse in the country. The current lighthouse is the ninth one to be built on the spot. Sankaty Head Lighthouse was built in 1850 and is still the original. It was moved, however, in 2007 when it was determined that it was about to fall off the cliff where it was located. At the very north end of the island, located in a wildlife reserve, is the Great Point Lighthouse. This one takes some work to get to – either a 7 mile walk, or a four wheel drive vehicle with a permit sticker. It is however, the most powerful lighthouse in New England and is considered by many to be a must see attraction. The current light is the third one built and was constructed in 1986 after the existing one toppled over. It is a replica, however, of the original 1816 tower. There are a number of festivals that take place on Nantucket. 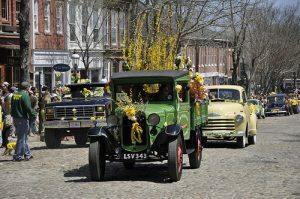 The April Daffodil Festival is a big event that signals the beginning of the tourist season. In May, there is a wine festival and the internationally famous Figawi Sailboat Race. June welcomes visitors to the Nantucket Film Festival, founded in 1996. September is when the Island Fair takes place. 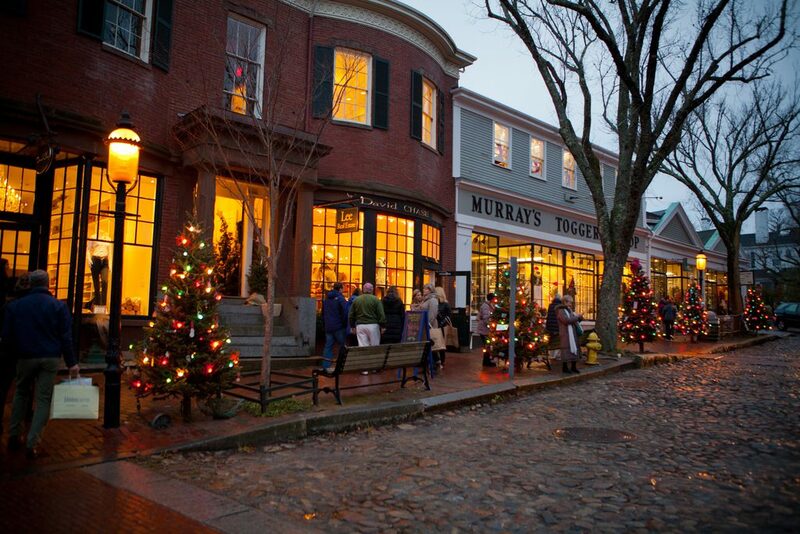 Nantucket Noel features Caroling and the annual Christmas Tree lighting on Thanksgiving weekend. The Christmas Stroll, is the big end of tourist season event which welcomes up to 12,000 visitors, including Santa, who arrives by boat.